Brightwell Aquatics Liquid Reef has twice the calcium relative to carbonates as compared to natural aragonite, making it a very powerful calcium source. The active components of Liquid Reef are provided by a combination of sources and include natural aragonite, increasing the solubility of the solution and the effectiveness of the method. Silicate- and phosphate-free. Examples of reef-building organisms familiar to hobbyists are: stony corals and their allies; molluscs including clams (bivalves) and snails (gastropods); tube worms that secrete calcareous burrows; and calcareous algae such as coralline, Halimeda, and Penicilus. These organisms require that the components of aragonite be in adequate concentrations if they are to thrive, regardless of how perfect the remainder of their environment is. 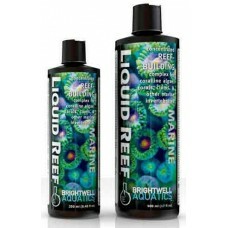 The advantage to this method of supplementation is that one product may be used to establish and maintain water parameters conducive to reef formation. Note that target ion-specific supplementation may be called for in some aquaria, depending upon stocking density of reef-building organisms and environmental conditions within the system. Additionally, hobbyists may choose to use Liquid Reef in conjunction with other methods of calcium, strontium, magnesium, and carbonate supplementation as a means of diversifying their dosing routine. The rate at which calcium and carbonates are extracted from the water is determined by the stocking density of reef-building livestock, type of lighting, and other conditions; therefore, each aquarium will have different requirements for the rate of supplementation.